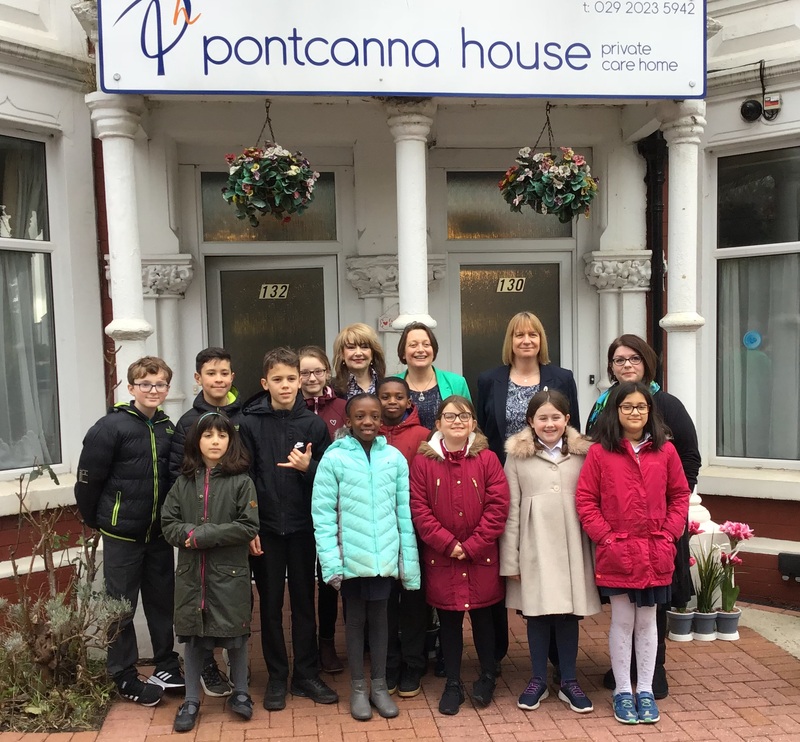 Pupils from Radnor Primary School were joined on Friday 25 January by the Older People’s Commissioner Heléna Herklots and Children’s Commissioner Sally Holland as they visited local care home Pontcanna House. During this special visit the commissioners got stuck into a game of skittles with the children and residents as well as enjoying crafts and a sing-a-long. Every Friday the year 5 and 6 pupils visit residents at Pontcanna House, a dementia specialist care home in Radnor. The project is a partnership between the school and the care home which aims to foster understanding of people with dementia. Radnor Primary teacher Sarah Pritchard helps to organise the initiative. “My class really looks forward to visiting Pontcanna House. The pupils and residents chat, do puzzles, play bingo, do crafts, play skittles and sing and dance together. In addition, each week we explore more about dementia using child-friendly resources online. Many of Mrs Pritchard’s pupils have established close ties with certain residents. 9-year-old Ellie likes to do crafts with her friend, Helen. “Helen is my favourite person, we talk about everything and we have a lot of fun. “At school I’ve learned about different types of dementia and how it affects people. I was really surprised to learn that people with dementia can’t get better, there’s no cure,” explains Ellie, who is in Year 5. Maisie Lee, 10, also loves visiting the home. “I like coming here to spend time with the residents and I think they like us too because they always smile and laugh a lot. “We play bingo and skittles and sometimes we all sing Dancing Queen! Talking to the residents is amazing and I learn a lot,” she says. A third of children know someone with dementia. Older People’s Commissioner Heléna Herklots wants to see more intergenerational projects in Wales. “This project is a good example of how local schools and care homes can be part of a shared community. It’s lovely to see how the children learn from the residents about their experiences – it’s a bit of living history,” the Commissioner said. “People with dementia can easily become isolated. It’s important they are supported to stay connected to their communities. Mrs Pritchard and her class recently raised £220 through a Memory Walk to raise funds for Alzheimer’s Society Cymru. Mrs Pritchard has also completed her training to become a Dementia Friend Champion. Alzheimer’s Society’s Dementia Friends programme aims to transform the way the nation thinks, acts and talks about the condition. There are now 2.8 million Dementia Friends in the UK.